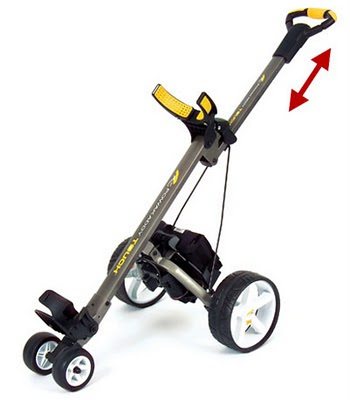 My father-in-law, a golf fanatic who's in the market for a power-assist golf pushcart, pointed out this little gem of usability design: the PowaKaddy, despite its unfortunate name, has an ingenious control system. Instead of pressing buttons to command it to go forward, go backward, and stop, the handle slides along the bar as shown by the red arrow. To move the cart forward, push the handle forward; to move it backward, pull it; and to stop, well, just stop. It means that the user isn't really "controlling" the cart as much as the cart is "following" the user - like intelligent cruise control that keeps a constant distance from the car in front of you. It must give the experience a whole new feeling, too - instead of commanding the cart, the cart is giving you what you need without you having to ask. That's one smart cart - and, if well-engineered, a very usable design.